The Hall of Fame quarterback talks about the Canton balloting process, T.O., OT and what makes Tom Brady the G.O.A.T. Former NFL quarterback Dan Fouts and former wideout James Lofton made history when they became the first Hall of Famers to cast ballots in the enshrinement vote, joining the regular group voters at the Super Bowl in Houston. Fouts spoke to The MMQB about his new duty, disagreements with sportswriters, the controversial case of Terrell Owens, and the greatness of Tom Brady. KAHLER: What interested you in becoming a Hall of Fame voter? FOUTS: For years, members of the Hall, enshrinees had always wondered why they didn’t have a vote. I heard the argument from the board of trustees and I really couldn’t argue with it. Once I was given the opportunity, I told my fellow enshrinees that now they had a voice in the room, two voices in the room, and I also promised to poll them to get their input as to what they thought and so that was my primary goal. KAHLER: How did you poll your fellow enshrinees? FOUTS: Through the Hall, we sent out a ballot with the finalists’ names on there with a yes or no box to check and it was a simple as that. KAHLER: Did anyone have a strong opinion that you took into account? FOUTS: Of course. There was some good feedback and the one thing I did promise them was confidentiality. Unless they have already been on record supporting one or the other, then I didn’t use their name. KAHLER: Did you feel pressure or a certain sense of responsibility to represent players in the Hall of Fame? FOUTS: I didn’t look at it as pressure, I looked at it more as an opportunity to voice the opinion of my fellow enshrinees, along with my own opinion. That’s the way I approached it. KAHLER: Last year you sat in on the meeting, but couldn’t vote. How much time did you spend preparing for this year’s meeting, the first when you were allowed to vote? FOUTS: Not sure I could count the hours, but they send you a book once the 94 names are released and you start plowing through it. There are a couple of things that go into forming your opinion, and perhaps the last thing is the presentations and the debate themselves. KAHLER: Now that you’ve participated, did you receive any negative feedback or Twitter trolls who disagreed with the choices? FOUTS: Just in what you read in articles, nothing personally. I am just one of the 48 votes, so that’s what I would tell somebody who would have an argument. But there is always going to be arguments and strong opinions one way or another, that’s part of the job and that’s what you come to expect. KAHLER: Did you find any disconnect between your opinions as a former player and the opinion of the media members? FOUTS: Of course. Almost you come to expect that, but also, I felt that there was a great deal of interest from the other panelists towards the opinion of James [Lofton] and myself as the Hall of Famers. I think it was a good mix. KAHLER: Can you to point out any particular topics that highlighted the difference between you and Lofton and the sportswriters? FOUTS: You look at the final vote and you can almost go down the list. There’s not one that I would pick out, because I wouldn’t want to speak for James as well. KAHLER: The most controversial decision this year was Terrell Owens. As a Hall of Famer, do you think Owens deserves to be in? FOUTS: Well, I think the vote stands for what it is. There were strong arguments both ways. His history is just a tough one to shake, either the positive side or the negative side of it. It only takes 10 votes to keep you out, 10 out of 48 and that is a tough hurdle to overcome when there are as many negatives as there are positives to a case. KAHLER: How did you vote on T.O.? FOUTS: In my position, I think that it’s best that I don’t share who I voted for, though I did vote for Don Coryell, how’s that? 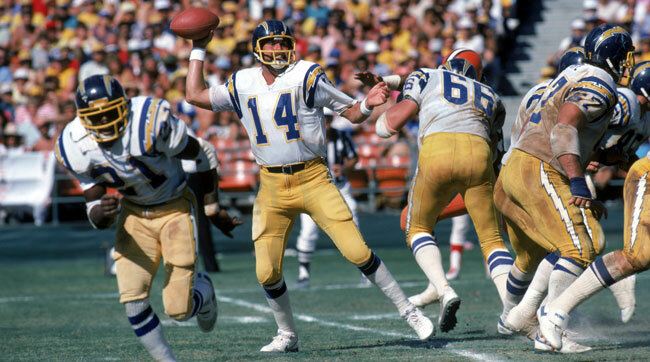 Dan Fouts drops back to pass in 1983. KAHLER: Did you give any speeches or make the case for any finalists in the meeting? FOUTS: I did a couple times. Of course the biggest one was for Coryell. We fell short there, but he is deserving and I am confident that at some point he will become a Hall of Famer. KAHLER: Coryell was your coach for 14 years in San Diego. Do you think that bias taints your argument or supports it? FOUTS: I think the strongest argument that I made was to not necessarily take my word for it, although it is obvious, but to listen to the endorsements that have come in from John Madden and Joe Gibbs and Don Shula and Bill Walsh and Dan Rooney. I just asked the members of the panel, how you can ignore those five Hall of Famers? These are Hall of Famers that you voted in, and the greatest names of the coaching and front office profession. KAHLER: Did you learn anything from this year’s failure that will help to get Coryell into the Hall in the future? FOUTS: Yeah, and I think I will keep those ideas to myself at this point, just because I don’t want to muddy the waters. There is a lot of ways to go about this thing and again, it only takes 10 to say no and it is hard to read minds sometimes. KAHLER: How important was it to have the voice of former players in the room to weigh in on a case like T.O.? FOUTS: Having James and myself in the room provided some insight that the other panelists just don’t have. We’ve been in the huddle, and the huddle is an important place to be and a wonderful place to be. KAHLER: Now that you’ve been through your first round of voting, is there anything that surprised you about the process? FOUTS: There were a number of people in the room that I never heard a word out of. That was interesting because there were about 10 guys that did not say anything. Usually those are the ones that are on the negative side of things. Unless they have a really strong opinion on the negative side, those guys usually don’t say anything. KAHLER: Was there a final decision that you were shocked by? FOUTS: No, I thought it was a good vote. KAHLER: As a Hall of Fame QB, I want to get your analysis on Tom Brady. What is it like being down 28-3 in a game? In the Super Bowl no less. What are you thinking in that situation? FOUTS: The first thing is you just try to get one first down to get something positive to happen. As you move on down the field, you’re thinking, We’ve got to get points. You’re not thinking field goals at this point, you are a little bit more aggressive after you build some momentum. But the thing that happens when you throw the ball a lot, is the pass rush becomes less and less and less. If you are only rushing four guys, as Atlanta did, and you are dropping seven, the offensive line has seen every stunt that you can run, so they are ready for anything. If you notice in the game, Brady has been hit a lot in the first three quarters, but in overtime and most of the fourth quarter, he was not touched. It’s because the offensive line knew what to expect from the defensive line that was trying to get to Brady. It’s an interesting thing that happens. People say, Oh, you can’t throw the ball that many times, but the more you throw, the easier it is on your offensive linemen. KAHLER: What would you say about Brady’s legacy after this Super Bowl. Is he the greatest of all time? FOUTS: Well, it’s always going to be a debate about who is the best at whatever and what you want to do in a debate is have ammunition. And Brady has provided all of the propane; he has plenty of ammunition. It was similar to when Montana was at this stage, whether he is the greatest of all time, and he was building up a lot of ammo for his debate. It comes down to who is the freshest in your mind and who is your favorite? Brady has a lot going for him. KAHLER: When New England won the coin toss for overtime and got the ball, they had the upper hand to win the game. What do you think about the current state of overtime? FOUTS: I really prefer the college overtime rules, I think they are fairer and dramatic and I think it is a better system. Having said that, I don’t know why in the world in the NFL we even have ties anymore in the regular season. That makes no sense to me at all, because all that does is muddy up the playoff scenarios at the end of the year. I’d like to see two things change. Number one, go to the college system and number two, get rid of ties in the regular season. The other thing the league talks about is safety and player safety, but by having the present overtime system, you are actually asking the players to play more than they would in the college system. If they are thinking about really taking care of the players— if you play a regular season game and an overtime period, that’s another 15 minutes if nobody scores. And that’s 15 minutes after 60 minutes, so the exponential chance for injury is that much greater. KAHLER: You never made it to a Super Bowl, so you know firsthand how hard it is to get there. How impressive is it that Brady has not only made it there, but won five times? FOUTS: It just speaks to his greatness when you think of the different cast of characters and players that he has had for those Super Bowls. The constant is him and [Bill] Belichick. Coaches have come and gone and players have come and gone and the two that have not are those two. KAHLER: What was your reaction to this game? FOUTS: I was thinking that Atlanta blew it in a number of ways, but primarily at the end when they were in field goal range. That was mind boggling to me, especially with such a good place kicker in Matt Bryant. They played right into Brady’s hands, basically. KAHLER: You lost two AFC Championship games in your career. From that experience, how do you think Atlanta recovers from a heartbreaking loss like this? FOUTS: Anytime you lose the last game of the year when you are in the playoffs, it is horrible. It’s hard, period, to put together a season like Atlanta had. Maybe you draw the analogy with Carolina, their hangover from their loss against Denver is monumental. I don’t think that will happen with Atlanta, although they do have major coaching changes, both defense and offensive coordinators are going to be new, so there is an adjustment there and then there is some soul searching as well. KAHLER: Is there anything you saw Brady do on Sunday that the average fan or NFL writer wouldn’t pick up on? FOUTS: We’ve seen this act before, every time you watch a Patriot game. He is in total control of himself and the offense, and sometimes he’s in total control of the defense too!